View of the dargah of Shaikh Salim Chishti and the tomb of Islam Khan beside it in the courtyard of the Great Mosque at Fathpur Sikri. bl.uk > Online Gallery Home	> Online exhibitions	> Asia, Pacific and Africa Collections	> View of the dargah of Shaikh Salim Chishti and the tomb of Islam Khan beside it in the courtyard of the Great Mosque at Fathpur Sikri. 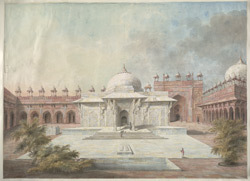 Watercolour of the tomb of Shaikh Salim Chishti and Islam Khan from 'Views by Seeta Ram from Tughlikabad to Secundra Vol. VIII' produced for Lord Moira, afterwards the Marquess of Hastings, by Sita Ram between 1814-15. Marquess of Hastings, the Governor-General of Bengal and the Commander-in-Chief (r.1813-23), was accompanied by artist Sita Ram (flourished c.1810-22) to illustrate his journey from Calcutta to Delhi between 1814-15. Idealised view of the 'dargah' of Shaikh Salim Chishti and the tomb of Islam Khan beside it in the courtyard of the Great Mosque at Fathpur Sikri. This white marble tomb is situated in the courtyard of the Jami Masjid, the principal congregational mosque, within the palace-city complex of Fatehpur Sikri. The Mughal Emperor Akbar (r.1556-1605) choose this location in order to be close to Shaikh Salim's refuge as he had successfully prophesied the birth of Akbar's heir, Prince Salim (Jehangir). The Jami Masjid (Dargah Mosque), completed in 1572, took five years to build and was dedicated to the saint who died at around the same time. The delicate lattice screens and serpentine eave-supporting brackets on the saint's tomb are some of the finest carved marble decorations in India. These were inspired by those on the Stonecutter's Mosque, built in 1565, for Shaikh Salim in his complex near the city.